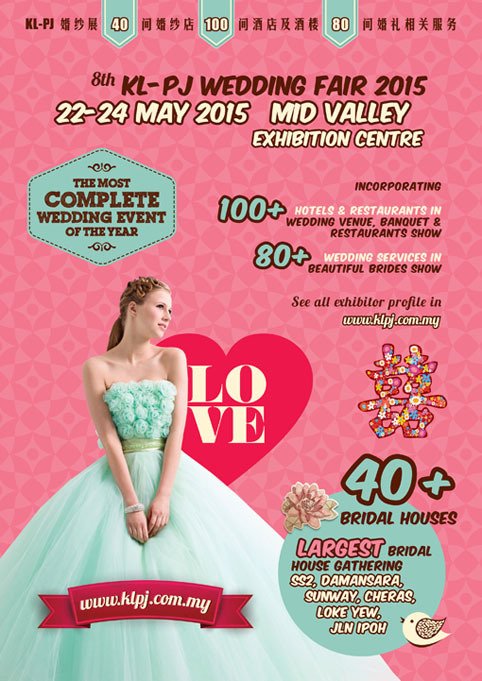 8th KL-PJ Wedding Fair 2015 on 22, 23 & 24 May 2015 at Mid Valley Exhibition Centre is the premier wedding expo in Malaysia. Featuring KL-PJ Top 40 Bridal House / Bridal Shop from SS2, Sunway, Damansara, Puchong, Jalan Ipoh, Loke Yew and Cheras. This year, we are bringing you some of the top bridal house from Penang & Johor. KL-PJ Wedding Fair 2015 also incorporates more than 100 Hotels & Restaurants for your Wedding Dinner in KL, PJ, Penang, Malacca and Johor area. Plan your dream wedding within your budget or in the most luxurious 5-star hotel banquets. Please visit http://www.klpj.com.my to view all exhibitor profiles.